Illinois Abolishes The Death Penalty Democratic Gov. Pat Quinn signed legislation Wednesday abolishing capital punishment and commuted the sentences of the 15 inmates on death row. The move comes more than a decade after the former governor imposed a moratorium out of concern that innocent people could be put to death. Illinois Gov. Pat Quinn speaks with reporters after signing legislation abolishing the death penalty in the state at the capitol in Springfield on Wednesday. Illinois Gov. Pat Quinn abolished the death penalty Wednesday, more than a decade after the state imposed a moratorium on executions out of concern that innocent people could be put to death by a justice system that had wrongly condemned 13 men. Quinn also commuted the sentences of all 15 inmates remaining on Illinois' death row. They will now serve life in prison. As he signed the bill, Quinn called it the "most difficult decision" he has made as governor. But he said the best step forward for Illinois was to be done with the death penalty altogether. "We all know that our state has had serious problems with respect to the system of the death penalty for many years," he said. State lawmakers voted in January to abandon capital punishment, and Quinn spent two months reflecting on the issue, speaking with prosecutors, victims' families, death penalty opponents and religious leaders. Quinn said he studied every aspect of Illinois' death penalty and concluded that it was impossible to create a perfect system, "one that is free of all mistakes, free of all discrimination with respect to race or economic circumstance or geography." Richard Dieter, the executive director of the Death Penalty Information Center, said no state has studied the death penalty more than Illinois. "For a Midwest state that actually had one of the larger death rows in the country to come to this point, I think, is even more significant than some of the earlier states which hardly used the death penalty," he said. 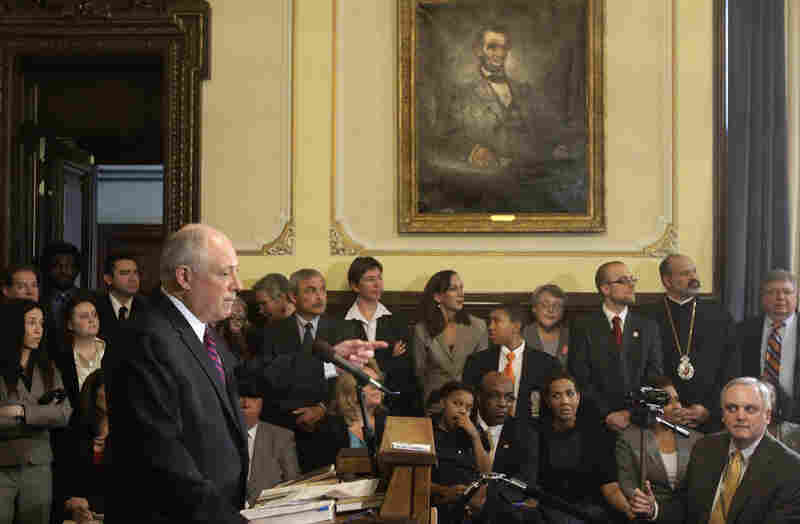 Illinois' moratorium goes back to 2000, when then-Republican Gov. George Ryan made international headlines by suspending executions. He acted after years of growing doubts about the justices system and after courts threw out the death sentences of 13 condemned men. Shortly before leaving office in 2003, Ryan also cleared death row, commuting the sentences of 167 inmates to life in prison. Illinois' last execution was in 1999. When the new law takes effect on July 1, Illinois will join 15 other states that have done away with the executions. Quinn said he hoped other states would follow. "I think if you abolish the death penalty in Illinois, we should abolish it for everyone," he said. New Mexico had been the most recent state to repeal the death penalty, doing so in 2009, although new Republican Gov. Susana Martinez wants to reinstate it. Quinn consulted with retired Anglican Archbishop Desmond Tutu of South Africa and met with Sister Helen Prejean, the inspiration for the movie Dead Man Walking. Pam Bosley, who helped organize a group for families of children killed by gun violence, tried to talk Quinn out of signing the bill. Her 18-year-old son, Terrell, was shot to death in 2006 as he was coming out of church. "I can't see my son at all no more. I can't see him grow old," she said. "They took all that from me, so I feel that their life needs to be ended." But death penalty opponents argued that there was still no guarantee that an innocent person couldn't be put to death. Quinn's own lieutenant governor, Sheila Simon, a former southern Illinois prosecutor, asked him to abolish capital punishment. Quinn offered words of consolation to those who had lost loved ones and announced that there would be a death penalty abolition trust fund to provide resources to relatives of victims. "You are not alone in your grief," he said. "I think it's important that all of us reach out through this trust fund in helping family members recover." Twelve men have been executed in Illinois since 1977, when the death penalty was reinstated. The last was Andrew Kokoraleis on March 17, 1999. At the time, the average length of stay on death row for the dozen men was 13 years.